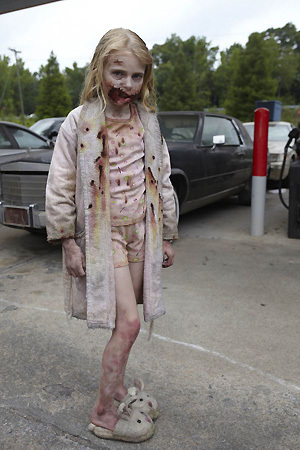 Addy Miller is a young actress who shot to fame with her small but memorable role on the pilot episode of the AMC hit drama, “The Walking Dead” as a little girl zombie shot in the opening sequence. If you look further into Addy’s growing résumé, you will see a versatile young actress who has worked with some of Hollywood’s biggest stars. I recently talked with Addy to find out more about this rising star. 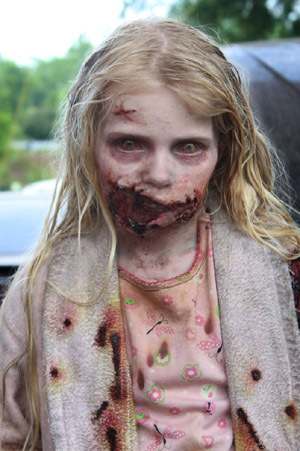 Mandy: Your role on the Walking Dead was small but memorable, does it amaze you how people have responded to it? Addy: It amazes me every day! I mean here we are in season 3 and I am still getting compliments and new fans all the time. The Walking Dead fans are the best out there too. I feel so lucky and blessed, I hope this never gets old!! Mandy: Would you go back to play a zombie again if you were asked? Addy: Yes, in a heartbeat!! I would go back for any role The Walking Dead offered. I know it is not likely, but going back to the set would be like going home. I get to see the rest of the cast at conventions and I miss them when it is over, so being able to see them everyday would make me so happy. Mandy: Any interesting stories or memories from your time on the set? Addy: I’ll tell you a story I don’t tell very often. My day on set was the first day of filming with zombies for TWD, so Sarah Wayne Callies came by to meet me and watch the scene. I was so excited when I saw her because I remember her from “Prison Break”. Mr. Darabont ended up kinda assigning her to watch over me the whole day. In between breaks he would send her over to make sure I was doing ok. I just couldn’t believe it, she was asking me that!! Shouldn’t I be asking her? It was surreal! Mandy: There are rumors of you playing a young Barbra in a Night of the Living Dead remake, any truth to them? Addy: I have been asked to play Young Barbra in a remake of NOTLD. I know that this character is not in the original movie, but I am still excited over the role. I even get to be in a scene with the original Barbra, Judith O’Dea! Mandy: For being so young, you’ve worked with a lot of Hollywood heavyweights, what have you learned from them? Addy: Oh that’s a good question! I think I have learned that everyone is human. What I mean is that everyone makes mistakes or brings their own ideas to the scene. It has helped me to relax and realize that my opinions matter too. I will say the best piece of advice I have gotten though wasn’t from being on set, but was from a horror convention. I was at a group dinner and next to me was Robert Englund. He told me to always read, read anything I can get my hands on, from different scripts to novels, anything that could allow me to feel and become that character. Since I am young, I don’t really have a lot of life experience to pull from for certain scenes, and reading and feeling those characters will help me. Mandy: You’ve shown interest in working behind the scenes, what aspect interest you the most? Addy: At first, I was interested in the lighting and camera, but now I think I would love to be in casting. It just seems like something I would like to try and would enjoy. Mandy: You’ve attended several conventions and are active on your Facebook and Twitter pages, do you enjoy the interaction with your fans? Addy: I really do love my fans. To be at a convention and someone come up to me and tell me their thoughts on a show or character and how much they love it, it is such a good feeling. I also try really hard to respond to fans on Facebook, Twitter and Instagram. They get so excited when I write back, it is great to see! Mandy: Who do you look up to as a role model? Addy: Dakota Fanning and Taylor Swift. I actually got to meet Dakota Fanning on set of “The Secret Life of Bees”. She was so sweet! I got to play a younger version of her character, and to prepare for my role, I watched some of her older movies to watch her facial expressions. I quickly became a fan of hers and especially like the kind of movies she does, like dramas. I love Taylor Swift songs too. She also realizes that her fans look up to her as a role model, so she takes it seriously and is trying lead by example. I like how she dresses and is more reserved. I hope I can be like her for my fans one day. Mandy: You volunteered this summer at ASNC (Autism Society of North Carolina) Camp Royall, how was that experience? Addy: It was so much fun. I really enjoyed connecting with the kids, which can be hard for some of them. The ASNC made me go through counselor camp too, so I also learned a lot on how I can help my two brothers at home, whom also have autism. I went back for Winter Camp right after Christmas, and plan on being a volunteer this coming summer too. Not sure I can do 4 weeks like I did last summer, but I will be there as much as possible, it is a second home to me. Mandy: Any upcoming projects you can tell us about? Addy: I do have a lot coming up this year, but have learned not to talk about them until I actually film, because sometimes it doesn’t work out. I will say my IMDb is pretty accurate with upcoming projects (www.imdb.me/addymiller), and I also announce things on my Facebook (Addy Miller Fan Page), Twitter (@TheAddyMiller) and Instagram (@TheAddyMiller) as well. Addy Miller is Officially Plugged in.. watch her video here… here.